2 Advising an increase in Physical Activity - Why Bother? 3 How much Physical Activity is enough to make a difference? As physiotherapists we frequently provide patients who come into our clinic with advice on how to improve their physical condition, usually in relation to a specific health problem which for which they seek treatment: low back pain, plantafasciitis, etc. We expect to advise our patients on how best to treat their condition with exercise, and how to prevent recurrence, but do we also look at the larger picture, ie. the general fitness level of each individual? This is particularly important considering Physical inactivity [PA] is the 4th leading cause of global mortality. Advising an increase in Physical Activity - Why Bother? Historically, physiotherapy interventions, ranging from electrotherapy, manipulation through to exercise recommendation, have been centred on the restoration of function lost as a result of either injury, or of a musculoskeletal or neurological condition. In recent years physical inactivity has been shown to be one of the main risk factors for non-communicable diseases (NCDs), including cardiovascular disease, diabetes and cancer. As therapists, we can influence the behaviour of people who walk into our clinic, and make them aware of the enormous benefits of physical activity including the benefits to their health as well as to their mood and general well-being. An alarming statistic: We are approximately 20% less active than people were in 1961. If this trend continues, by 2030 we will be 35% less active. 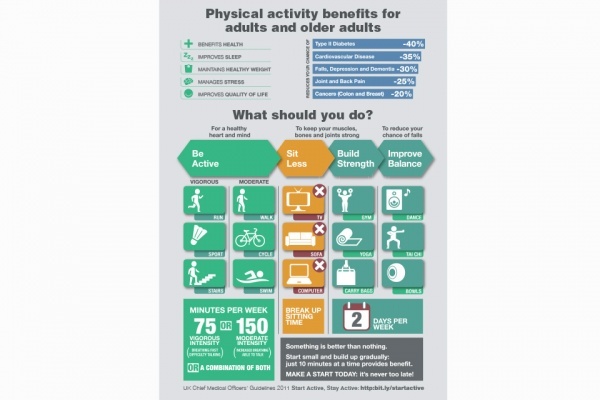 How much Physical Activity is enough to make a difference? Chat in general terms about different ways to increase PA, trying where possible to have a 2-way discussion with the person about their lifestyle and family commitments, and how they could incorporate more PA into a typical day. It is quick and simple to put up some posters about PA and its benefits on the walls of your clinic room, or better still, the waiting room. Anything on the wall of the waiting room is likely to reach a larger audience as people who are just accompanying patients also see these. If your practice has a website, this is a very useful place to have some information about PA and its benefits. You can then guide patients to this resource when you talk about PA in their treatment session. Any support groups for different populations (eg. older people, or people with Stroke, etc.) which offer exercise classes. Have staff meetings as "walking meetings"
↑ Ng SW, Popkin B (2012) Time Use and Physical Activity: a shift away from movement across the globe. Obesity Review 13(8):659-80.